When a task is personally meaningful, your students will master the keys. Keyboarding is not a technology program. It is an essential skill to be able to use the computer efficiently. However, the ability to use the keyboard should not be the foundation of your technology program. Do not wait for your students to become master typists before introducing other technology skills. Formal keyboarding instruction has its benefits. However, the application of those typing skills to complete a meaningful task is a strong motivator to improve speed and accuracy. Your students will evolve into better typists while completing reports, constructing web pages, organizing data, designing posters, and creating presentations. All you have to do is watch your students send a text message to a friend on a cell phone to know that when the task is personally meaningful your students can master the keys! It is true. Your students need to know how to type. Proper finger positioning, speed, and accuracy are important. The value of keyboarding should not be underestimated. Good typing skills will allow your students to enjoy writing more because they won’t have to hunt for the correct letter to type a word. In addition, once familiar with the location of the keys, students can communicate ideas more clearly as the focus is on the content and not on the mechanics of typing. As well, students can complete their school work faster with fewer mistakes when they are confident typists. Despite the benefits, keyboarding cannot be the only task your students complete during their scheduled computer time. To adequately prepare students for life in a digital age where technology is seamlessly integrated into how people play, learn, communicate, work, and share information it is essential that they learn additional skills. For example, word processing, spreadsheet, Internet, presentation, graphic, and desktop publishing are just some of the technology skills that your students need to learn to be able to efficiently acquire, analyze, and communicate information. How you schedule keyboarding into your technology program is unique to your teaching situation. Some teachers that have two class periods a week will schedule keyboarding in one class and leave the second class for other technology skills. Other teachers, who only have one class period a week, will begin or end the class with 10-15 minutes of keyboarding, which leaves the remainder of the time for other computer-based activities. Still other teachers, that have their students for only a few weeks during the school year as part of a rotation, will often begin the course with keyboarding or interweave the skill throughout the study period. Most teachers use software such as Mavis Beacon Teaches Typing or All the Right Type to teach keyboarding with drills and games. No matter how fun it is to use, many students find the task onerous. If they spend too much time in the lab keyboarding, boredom can set in and a dislike for computer class. To avoid this from happening, it is a good idea to deliver keyboarding lessons in smaller chunks and then use the remainder of the time to complete meaningful assignments such as creating a timeline, interactive map, or advertisement. 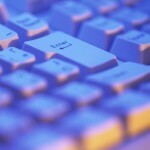 Do you teach keyboarding? How do you schedule keyboarding into your computer class? What program do you use to teach keyboarding? Share your experiences! Thanks for this article. Some parents and homeroom teachers were complainig about keyboarding last week. I also didn’t want to teach keyboarding instead of teaching TechnoKids project. There are classes that i teaach one period per week and sonetimes two periods. Now i am starting to teach pupils keyboarding and schedule it as you mentioned here. Thank you.